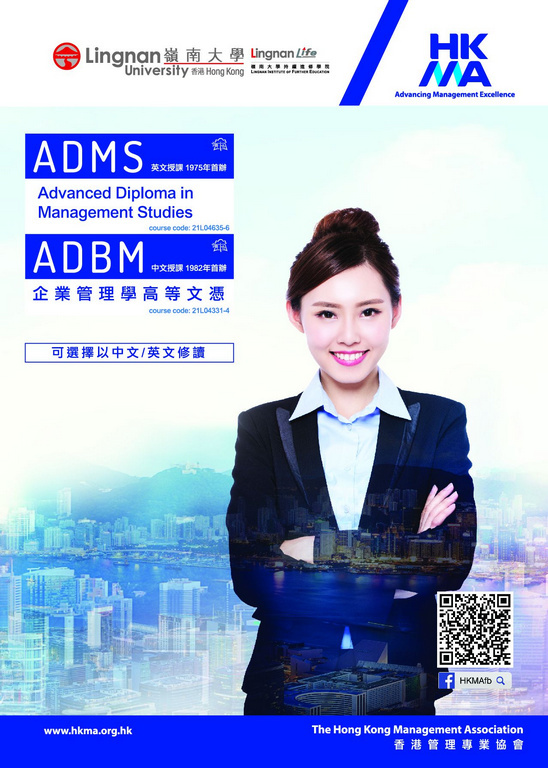 The Advanced Diploma in Management Studies Programme (ADMS) (formerly Diploma in Management Studies) is a Joint Diploma Programme undertaken by The Hong Kong Management Association and Lingnan University to meet the needs of in-service managers and executives who seek a formal education in modern business management. Through an accelerated development process, it provides managers and business executives with the essential management knowledge and expertise to make greater contributions to their organizations. Graduates of the Advanced Diploma in Management Studies Programme (ADMS) course are eligible to apply for admission to the following Bachelor's and Master's degree programmes offered by various prestigious overseas universities in association with the HKMA. Those who are admitted to top-up Bachelor's programme may be granted exemption from 1 or 2 years of study of the programme. The Advanced Diploma in Management Studies Programme commences in February, June and October of each year. The full Advanced Diploma in Management Studies Programme(ADMS) has now been included in the CEF approved list. All modules are reimbursable for the CEF. Students applying for the Continuing Education Fund (CEF) should submit their applications directly to the Office of the CEF before the commencement of the programme. For details, please visit the website: www.wfsfaa.gov.hk/cef or contact the CEF enquiry hotline: 3142 2277.